Dr Kwame Addo-Kuffuor, Chairman of the Board of Trustees of the Social Security and National Insurance Trust (SSNIT), has reiterated the commitment of the board to sponsoring science, maths and technology education. He called on institutions to not only offer encouragement to the youth but empower them to excel in science, maths and technology, which in turn would help accelerate Ghana’s rate of development. “This will push our youth to seek excellence in all endeavours and help develop this nation,” he added. The Board Chairman, who is also a senior medical doctor, was not happy that Ghana seems to be crawling after several years of independence. “How come we are exporting unprocessed cocoa, gold, timber, bauxite and others while countries which have little or no natural resources like Singapore are doing well?” he asked. Citing the example of Rwanda, he said because they embraced science and technology, the country is gradually emerging as a leader on the continent. “It is for this reason that for the first time, SSNIT has decided to be part of the National Science and Maths Quiz Competition. The Trust seeks to raise a crop of young people who would feel motivated to pursue and excel in science, maths and technology in order to make a positive impact on national development,” Dr Addo-Kuffuor said. The winners were offered GH¢10,000 in treasury bills, an internship programme at SSNIT anytime they qualify and national service placement when they are due. 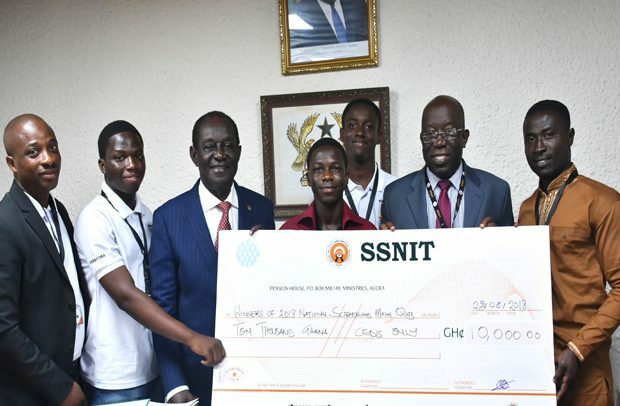 Solomon Mantey Sodzi, tutor and leader of the team, who spoke on behalf of the winners, Kissi Annor Kwaku, Fenny Benjamin and Oteng Kwadwo Frimpong, thanked SSNIT for the kind gesture and said this would motivate them to do better next time.